L was in town on a layover. She had pinged me in advance and requested that I take her to On Lot 10 - thus fulfilling my duties as ambassador-at-large for David once more. She had seen me rave about "the best beef in the world" and wanted some. So I got in touch with Susan the Great - whom L introduced me to almost 2 decades ago - and she promptly organized a little gathering for tonight. As usual we gave David carte blanche, and only requested the Rubia Galega in advance. While I was thinking of ordering double portions of fewer starters, David would have none of that... and insisted on sending us single portions of more dishes so that we could taste. Not surprisingly, I kinda got the short end of the stick tonight... which was OK because I knew I would be coming back again next week! MUAHAHAHAHAHAHA!!!! Artichoke heart foie gras presse: truffle/mushroom - this was cut into 6 wedges and there were 7 of us... so I gave up my slice since I was coming back next week. Got a slice of mushroom and 2 slices of truffle as consolation prize. Beef tartare "battuta": caviar/oysters - the beef is literally hand-beaten, and I believe very lightly seasoned... since there was a layer of caviar on top. There was also a ring of gelée. Steamed blackspot tuskfish 'en papillote' - the blackspot tuskfish (青衣) was soooo tender and delicious. The lemon and coriander clearly gave it a different fragrance and flavor profile than what one would find in Cantonese restaurants. Lomo de Rubia Galega - once again I have come for the great Rubia Galega, coming from 12-year old oxen that has been dry-aged for 120 days. Tonight, however, we were served strip loin instead of the ribeye. This meant that the meat was a lot leaner, with firmer texture. This was still very tender and relatively juicy, but it wasn't soft and melty as our guest of honor had been expecting. What hasn't changed, though, was the incredible explosion of flavors I experienced with every bite. That funky, cheesy flavor. From a slice of beef. Truly incredible. Well, I called shotgun and grabbed the bone... and eagerly gnawed on it. I also took the chunk of fat at the very end. I didn't dare eat the whole chunk, but carefully trimmed little charred bits from the edges. Sooooo freakin' awesome! I wish I were 10 pounds lighter so that I wouldn't care about taking all of this in. Oh and of course the taters and lettuce were incredible. How the hell does David make romaine lettuce taste so good?! Chartogne-Taillet Rosé - very fruity with lots of raspberries. Yum. 2005 Kistler Chardonnay Stone Flat Vineyard - toasty nose, nice and buttery. Drinking well. 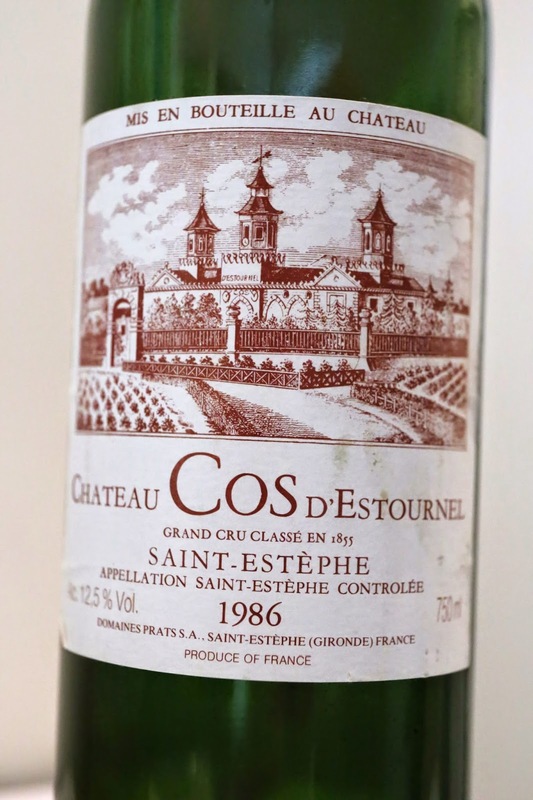 1986 Cos d'Estournel - initially I thought it might have been ever so lightly corked, but this grassy green nose faded with time. Smoky, a little earthy and mineral. Smooth on the palate and drank well. Thanks to the strict portion control with starters and the fact that we were having strip loin instead of ribeye, we actually weren't filled to the brim like we usually are. We briefly contemplated having dessert, but had a better idea. So I picked up the phone and called our friend Jeremy Evrard at Upper Modern Bistro, and asked him to prepare a table for the bunch of us. We were gonna have ourselves some cheese! Of course we let Jeremy full discretion so he could give us whatever was at optimal readiness. He knows how much I like Époisses and apologized for having run out of it. He even told me that my beloved fromagerie Gaugry is moving to using pasteurized milk for their Époisses! Quelle horreur!!! Brillat-Savarin with truffle shavings - could this triple-cream cheese get any better? Why, yes! Just add truffle! (Chabichou de Poitou?) - not 100% if I this was the cheese we had. Made from goat milk. The goats move to munch on grass from the coastal areas, which delivers the minerality that shows up here. Creamy but firm texture, a little sweet and nutty. Pavé de la Ginestarié - a little acidity here, kinda creamy and sweet, and a little nutty. Pérail - made with sheep's milk. Pretty pungent and a little savory. Probably my least favorite tonight. Comté, aged 4 years - my standard for Comté these days... Yes, definitely a spoiled brat. Roquefort Le Vieux Berger - made by Maison Combes, it is reputed to be the last hand-made Roquefort in France. Really salty here, but also nutty. Mimolette - I didn't ask how old this was, but I figured Jeremy only serves us the 24-month variety, which would explain the saltiness. 2012 Schlumberger Pinot Gris Les Princes Abbés - tropical peach and a little flint. What a wonderful evening! It is always good to catch up with old friends... over some good food and good wine, and especially good cheese! I'm amazed at your restraint! I would have fought for the long end of the stick!